Project Goal: To build a brand new website for the "2017 Report: The State of the News". The website was supposed to showcase the 2017 annual report in a simple a nice manner, to represent the team, to be compatible for Mobiles and Tablets, etc. The big challenge was to deliver the project in 4 weeks. Influence Communication is a media information broker that specializes in the monitoring, summarization and analysis of printed and electronic media, especially the Internet and social media networks. Influence’s efficient network of media partners and press services, present in over 160 countries, gives them access to local news sources. For twelfth consecutive year, Influence Communication has made public its annual summary of the news that captured the attention of the media in Canada over the past 12 months. 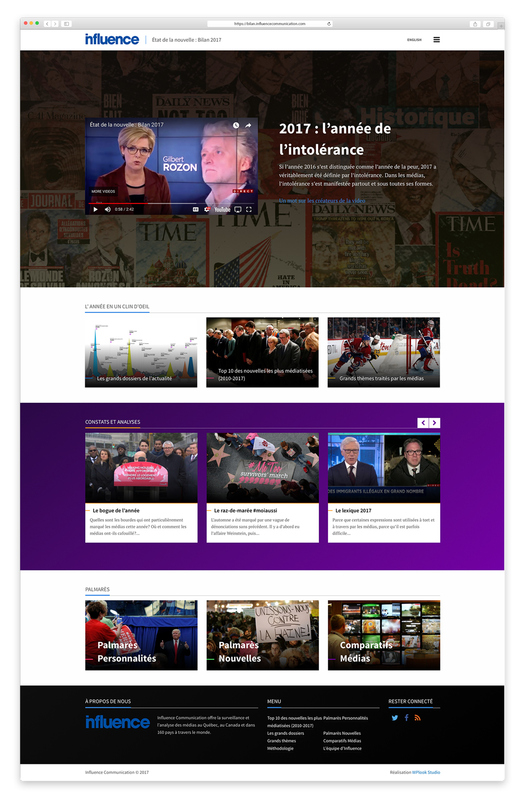 In 2017, Influence Communication mandated WPlook Studio with designing and developing a new website to present its State of the News: 2017 Report. We really enjoyed working alongside you, Victor was a rock we could count on in somewhat troubled water and a pleasure to make business with.